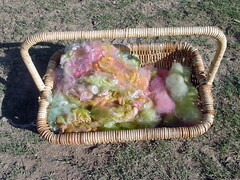 Here's the basket of fiber I took to the demo. White BL fleece dyed with Easter Egg dyes. You can see some of the rolags on the side, there. 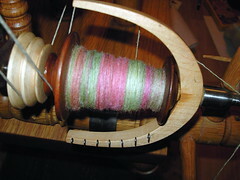 The skein I spun and 2-plyed at the demo. Would you believe it's *perfectly* balanced yarn? 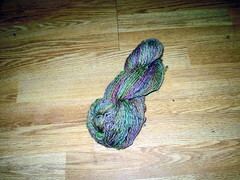 Closeup of the previous skein. 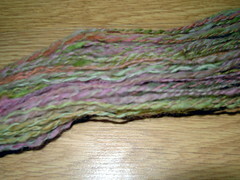 The yarn's not perfectly consistant, but for demo yarn it's not bad, I think.